Ever wondered what are some places of interest in Peru? Peru is a fascinating nation consumed with enchantment. Peru proudly boasts a fantastic culture, spectacular history, and extraordinary natural beauty. Once the heart of the Inca Empire, Peru is home to numerous world famous ancient ruin sites. There are many amazing destinations in Peru that you should visit. One of the world's greatest wonders, Machu Picchu is an unprecedented oasis and a bona fide archeological treasure trove. Located atop a majestic mountain about eight thousand feet above sea level, this fabulous Inca ruin site is open year round. The best way to reach the lost Inca City of Machu Picchu is by taking a train from Cusco. Machu Picchu is so secluded that it went centuries without the world being aware of its existence. Nobody even knows the reason it was built, nor why it was abandoned. Machu Picchu is shrouded with mystery and enchanting beauty. Though this remote ruin site is very isolated and difficult to reach, once you get there you will experience one of the most remarkable ancient destinations on the planet. The entrance ticket costs about forty dollars per person. The Inca Trail is a picturesque hiking trail that meanders between towering mountains and jungles. The trail leads to the sacred ancient capital of the Inca Empire, Machu Picchu. The Peruvian government has imposed new restrictions on the amount of people allowed to walk the trail in order to preserve the heritage and protect the trail. It is now necessary to make a reservation three months in advance during peak summer tourist months. The best time to visit the Inca Trail is June to August. The trail is closed during February for renovations. The cost of hiking the Inca Trail depends on many factors, including when you plan to go, and how many people are in your group. As a general rule, the more people, the better the price. Along the journey visitors will observe many very well preserved ruins. Experienced guides can lead the way and provide a safe and informative expedition. Some trails can last about a half hour, while others can take days. The Inca trail is an amazing physical experience which leads to some of the most spectacular ancient ruins on the face of the planet. The scenic and exhilarating ascent up to Sun Gate is an amazing hike. This is the final stage of the Inca Trail, the very trail that hikers use to journey up to the ruin sites. The scenic views are absolutely extraordinary, especially the vista of Huayna Piccu and the other ruin sites. This is where visitors will find the famous stone gates that correspond exactly to the summer and winter solstices. The best time to visit the Sun Gate is during the summer and winter solstices when the golden rays from the sun illuminate the gates directly, thereby provide the most spectacular site imaginable. The Sun Gate is just below the caretakers hut, by Huayna Piccu. Lake Titicaca is one of the highest altitude lakes on the face of the earth. There are a few spectacular islands in Lake Titicaca. Some of the most popular tourist destinations within Lake Titicaca include the floating Uros Islands, Isla Amantani, Isla Taquile, and Isla del Sol. The lake is the cradle of the Inca Empire. Also known as Machu Picchu Pueblo, Aguas Calientes is the closest village to the famous Machu Picchu ruin site. Aguas Calientes has many delicious restaurants and beautiful hotels. Natural hot baths are also here in Aguas Calientes, hence the name of the town. The hiking in the area is great, and the scenic views are incredible. Aguas Calientes is certainly worthy of visiting. The best way to get there is to take the train from Cusco. Peru is a spectacular land of infinite beauty and profound cultural enchantment. If you wonder what are some places of interest in Peru, you will certainly want to explore the ancient Mayan ruines. 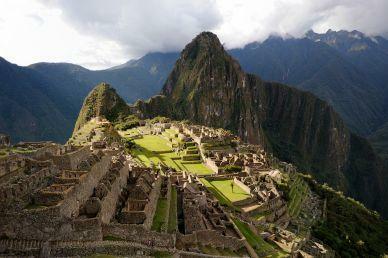 Machu Picchu is a majestic ancient Peruvian destination with unprecedented and timeless beauty. The scenic surroundings engulf the entire region and provide a magnificent backdrop. Here lies the epicenter of the Inca Empire, which still exists in Machu Picchu through the extraordinary historic archeology which can be witnessed throughout the ruin sites. Constructed atop a picturesque mountain, Machu Picchu was a religious city build amid the visceral majesty of the most secluded, inaccessible, and incomparable locations. Since good hotels and great food is so cheap, Peru is a wonderful family vacation idea. It's an exotic travel destination with pervasive hotel deals. Contact a general travel agency or Peru travel specialist to find out what packages and travel deals are currently available.